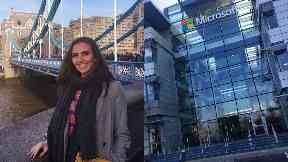 Laura Maclean, 22, went viral after sharing her email exchanges with Microsoft over the gaffe. An Aberdeen student who accidentally showed up a month early for an interview with Microsoft is "over the moon" to have landed the job. Laura Maclean, 22, went viral after sharing her email exchanges with the multinational technology company over the mix-up. In her eagerness to win a 12-month placement, the Robert Gordon University management with marketing student logged on for her Skype interview on January 18, rather than February 18. Miss Maclean, from Dingwall, did not realise her mistake and emailed Microsoft's recruitment team after they failed to show for the interview. Mortified over her gaffe, Miss Maclean told STV News that she hoped the company saw the "humorous side to the ordeal" and her "intense dedication to punctuality". Fortunately they did, and in July she will join the partner marketing advisory team in Reading on a year-long industrial placement. Miss Maclean said: "I am absolutely ecstatic. "It was a long process going through lots of interviews and flying to London for an assessment centre, so I'm delighted the hard work paid off." Although the hiring managers did not mention her viral tweet, an intern at a networking session spoke about the blunder. Miss Maclean said: "When I told her - reluctantly - it was me, she was so excited about it and said she couldn't wait to tell the other Microsoft interns in their group chat, which was so funny." With the interview out of the way, the 22-year-old can't wait to get started. She added: "It's certainly been a crazy journey up to this point, but I am over the moon about getting the job and can't wait to start. "Everyone at Microsoft was so welcoming and the Microsoft campus was very cool, so I'm sure I'll have a fantastic year there."